Donald Trump won the presidency with the votes of rural communities beset by industrial decline and opioid addiction — and the financial backing of rich, right-wing ideologues beset by progressive taxation. Since taking office, the president has developed a (largely) successful formula for eliding the tensions inherent to this coalition: Give the plutocrats their preferred policies, and let the masses eat Colin Kaepernick. But this gambit has its limits. Red America can’t live on culture-war grievances alone. Not when drug overdoses are killing hundreds of its sons and daughters every week. In 2016, 50,000 Americans lost their lives to the opioid epidemic, up from 33,000 the year before, according to the federal government’s preliminary count. That’s more than the number of Americans killed in combat in Vietnam. It’s more than die annually from car accidents or gun violence and more than the 43,000 who died from HIV during the worst year of the AIDS crisis. And unlike the victims of that plague, deaths from opioids are disproportionately concentrated in the rural counties that keep the GOP competitive as a national party. On other issues, Trump has been able to hide his betrayals of the party’s downscale wing in hollow rhetoric. Giant tax cuts for the rich can be framed as a means of onshoring jobs; cuts to health-care spending as an expansion of consumer choice. But there’s no talking point that can hide a botched disaster response; not from those living amid the wreckage, anyway. And that’s a big problem for Trump and his party — because, when it comes to the opioid epidemic, talking points are all that conservatives are prepared to offer: When the president’s opioid commission first recommended declaring the epidemic a national emergency last summer, the administration’s far-right budget director Mick Mulvaney — and much of the (heavily Koched-up) Domestic Policy Council — scoffed at “the multibillion-dollar price tag.” One senior administration official told Politico last week that “everyone wants opioids to be a priority” but that “there’s a lot of resistance to calling it an emergency” because of the “legal and budgetary implications.” This is a roundabout way of saying that many in the White House do not want opioids to be a priority, because that would entail diverting significant funds away from tax cuts for corporate shareholders. Trump deferred to such objections for months. But emergencies don’t go away when the White House makes them feel unwanted. And so, on Thursday, the president will take a half-measure: Instead of declaring the epidemic a national emergency — and thus, giving opioid relief efforts access to the billions of dollars in FEMA’s disaster relief fund — Trump will declare it a public health emergency (the Public Health Emergency Fund currently has all of $57,000 to its name). Nonetheless, the move is an important symbolic step, and will relax certain regulations and laws, so as to expedite the federal response to the crisis. What matters most, though, is what comes next. Soon, the president’s commission will release its official policy recommendations. There’s some ambiguity as to exactly what these will entail. But the broad outlines of a serious response to the opioid crisis have long been clear: To stem the tide of drug overdoses in the United States, the president will need to increase federal health-care spending, impose more stringent regulations on the pharmaceutical industry, and embrace a harm-reduction approach to drug abuse that insulates addicts from the worst consequences of their nonviolent crimes. In other words: He will have to break with governing preferences of the GOP donor class. The modern conservative movement’s animating purpose is to strip money from the welfare state and return it to the pockets of the “job creators” who earned it. Thus, Republicans have spent most of their time in power trying to pass trillion-dollar cuts to Medicaid and insurance subsidies for low-income people, even as a historic public-health crisis raged in their own backyards. Medicaid pays for 44 percent of all addiction treatment in Kentucky; 45 percent in West Virginia; and roughly 50 percent in Ohio. Every Republican senator from those states voted to slash $700 billion from the program anyway — except for Kentucky’s Rand Paul, who opposed that legislation because its Medicaid cuts weren’t nearly steep enough. To prevent his emergency declaration from ringing hollow, Trump will need to give up on repealing Obamacare, and order his administration to cease its (overt) sabotage of the individual insurance market. That isn’t just the plea of a progressive blogger — according to the Washington Post, multiple members of Trump’s opioid commission are pushing to include such language in their final recommendations. But the president will have to do more than that. Patrick Kennedy, a former former Rhode Island congressman serving on Trump’s opioid commission, told the Post that the panel is poised to recommend an expansion in health-insurance coverage and new subsidies to fund addiction treatment. This makes sense. 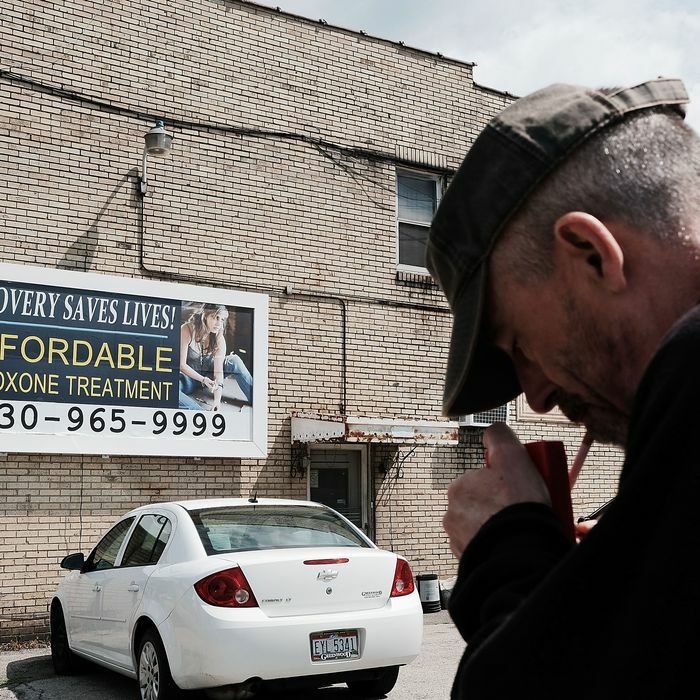 The primary reason for the opioid epidemic’s brutal acceleration may be this: In the United States, it’s much easier for addicts to find heroin than to find help. A 2016 report from the surgeon general’s office found that just 10 percent of Americans with a drug disorder secured specialty treatment. This result is largely explained by the fact that wide swaths of the country — including many counties where opioid abuse is prevalent — lack affordable treatment options. In 2016, Congress appropriated $1 billion, over two years, to fund addiction services. But this is woefully inadequate to the scale of our problem. Experts who spoke with Vox’s German Lopez suggested that it would take tens of billions of dollars — annually — to make treatment easily accessible for those who need it. Lopez notes that the total economic burden of prescription opioid abuse, alone, was pegged at $78.5 billion in 2013. Thus, a massive investment in addiction treatment could pay for itself, in the long run, by preempting even higher costs to our health-care system and economy. But to make such an investment, Trump will need to embrace ideas that are antithetical to the GOP’s main projects. Instead of seeking to curtail public spending on the health care of low-income people, he will need to increase it. And not only that — he will need to target that investment on the very non-working, dysfunctional poor whose undeservingness has long been his party’s favorite argument against the welfare state. And then, he’ll need to break with conservatism’s implacable hostility to regulation. The prescription opioid crisis has thrived on pill mills — renegade doctors and pharmacies that hand out OxyContin like (pricey) Tic Tacs. But these illicit practices would have been impossible, had pharmaceutical distributors not put profit over probity: In a two-year period, three of the largest drug distributors in the country shipped nearly 9 million hydrocodone pills to a single pharmacy in Kermit, West Virginia — population, 392. This was an especially egregious case of a common phenomenon. As prescription opioid wholesalers fed the booming black market for pain pills, conservatives on Capitol Hill grew outraged — at the Drug Enforcement Administration, for giving such distributors too hard of a time. Federal law empowered the DEA to freeze drug shipments that posed an “imminent danger” to a given community. As the opioid crisis spread, the agency began using that authority with greater frequency. In 2014, Republican congressman Tom Marino — Trump’s initial pick for drug czar — introduced legislation intended to restrict the DEA’s capacity to halt drug shipments. In a hearing with Attorney General Eric Holder, Marino lambasted the DEA for treating distributors like “illicit narcotics cartels,” a “mind-set” that the congressman felt was “extremely dangerous to legitimate business.” Republican senator Orrin Hatch led the effort to bring relief to these drug suppliers in the upper chamber. Eventually, Marino’s desired reduction of the DEA’s authority passed Congress by unanimous consent — as the Washington Post’s investigation of the matter vividly documents, giving undue deference to the demands of pharmaceutical lobbyists is a bipartisan pastime. Nevertheless, it was conservative lawmakers who led the charge. And it is conservative lawmakers who habitually fight to prevent the federal government from taking aggressive action against industries that profit off public health problems — because their ideology places a greater value on the liberty of private firms than on almost anything else. Combating the opioid epidemic will require Trump to reject his party’s allergy to regulation. Recent federal measures have significantly reduced the overprescription of opioids. Still, enough were prescribed in 2016 to fill a bottle for every American adult. Given the dearth of evidence that opioids are an effective treatment for chronic pain — and the glut of evidence for their dangers — this is a disconcerting statistic. Thus, the National Academies of Sciences, Engineering, and Medicine recently called on the Food and Drug Administration to conduct a review of opioids already on the market, and to strengthen its post-approval oversight of such painkillers. Trump should honor that recommendation. And once he’s done sicking the nanny state on the drug industry, he should turn to the insurers. In 2016, an Obama administration task force found that insurers were still discriminating against patients with mental-health disorders and substance-abuse problems, due to lax enforcement of laws that guarantee such Americans parity in the insurance market. If Trump believes the opioid epidemic is an emergency, he should direct the Department of Labor to crack down on such violations. Finally, and most critically, the president will need to break with conservatism’s virulent opposition to the very concept of harm-reduction policy. The most effective remedy for opioid addiction, bar none, is medication-assisted treatment (MAT). Under MAT, addicts are provided with methadone and buprenorphine — less powerful opioids that satiate most addicts’ cravings, and arrest their withdrawal symptoms, without inducing heroin’s debilitating, euphoric high. Decades of research, the World Health Organization, CDC, and National Institute on Drug Abuse have all demonstrated MAT’s efficacy. Some studies suggest that the treatment reduces mortality among drug addicts by more than 50 percent. And yet, the therapy is only available in about 10 percent of America’s conventional drug-treatment facilities. In reality, dependence on a substance and productivity are not mutually exclusive — a fact readily apparent to anyone who drank a cup of coffee this morning. Plenty of methadone users are productive members of society. But countless opioid addicts who lacked access to methadone — and thus, sought relief from withdrawal from the wrong batch of fentanyl — never will be. The conservative aversion to harm-reduction inhibits other, life-saving reforms. As governor of Indiana, Mike Pence resisted calls to provide opioid users with sterile needles, even as the first major outbreak of HIV in recent memory ravaged Scott County. Pence eventually relented. But the ideological belief that led him to drag his feet — that protecting people from the worst consequences of illicit behavior is to condone that behavior — remains core to the conservative worldview. In Maine, it led Republican governor Paul LePage to veto legislation that would have allowed pharmacies to provide naloxone — a drug that reverses opioid overdoses — to those at risk of suffering one, without a prescription. To protect heroin addicts against the threat of death would only “perpetuate the cycle of addiction” LePage argued, in defiance of copious evidence to the contrary. And this ideology renders more radical, evidence-based measures to reduce opioid deaths — like the provision of prescription heroin to incurable addicts — unspeakable in U.S. politics. To mount a response to the opioid epidemic commensurate with its severity, Trump will need to make naloxone available without a prescription at every U.S. pharmacy; invest billions in expanding access to MAT; and at the very least, launch pilot “prescription heroin” programs modeled on those that have succeeded in saving lives and reducing crime in Canada and Europe. Reality has always been unkind to the dogmas of movement conservatism. But in recent years, the abject uselessness of the GOP’s ideology to its own constituents has grown more conspicuous. Instead of adapting their ideology to changing circumstances — a financial crisis that exposed the immense hazards of deregulation, the deepening economic insecurity of their voters, the accelerating frequency of wildfires and hurricanes — conservatives have opted to mold reality into conformity with their prejudices. So, the housing crisis was caused by irresponsible (implicitly nonwhite) borrowers; corporate tax cuts are necessary to revive American manufacturing; climate change is a Chinese hoax. But the GOP’s rural white base does not witness the opioid crisis through the filter of Fox News — they see it out of their living-room windows. Conservatives can’t spin away this reality. And their ideology compels them to exacerbate it. The opioid crisis is now a public-health emergency for our nation — and that’s a political emergency for the Republican Party. Or, at least, it will be, if Democrats ever find the nerve to declare it one.